Before moving to London to study architecture in 1972, Zaha Hadid studied mathematics at the American University of Beirut. Her fascination with mathematical logic and geometry became rooted in the very foundation of her architecture, enabling her to rethink concepts of shape and form to create those famous harmonious, fluid surfaces and structures of hers. Without advances in design technology or computing, she probably wouldn’t have been able to manifest those seemingly abstract mathematical principles into exciting, breathtaking architecture. It’s quite fitting then that the first project to complete in the UK after her death last March, the Mathematics Gallery in London’s Science Museum, aims to portray mathematics not as an alien academic concept studied in isolation, but as a practice stretching across disciplines that has transformed our understanding of the environment around us and helped build the modern world. The design for the 900 sq m space, also Zaha Hadid Architects’ (ZHA) first permanent gallery space in the world, won in an open competition in 2014, places an emphasis on the subject’s more human stories and the impact its tools and ideas have on everyday life. 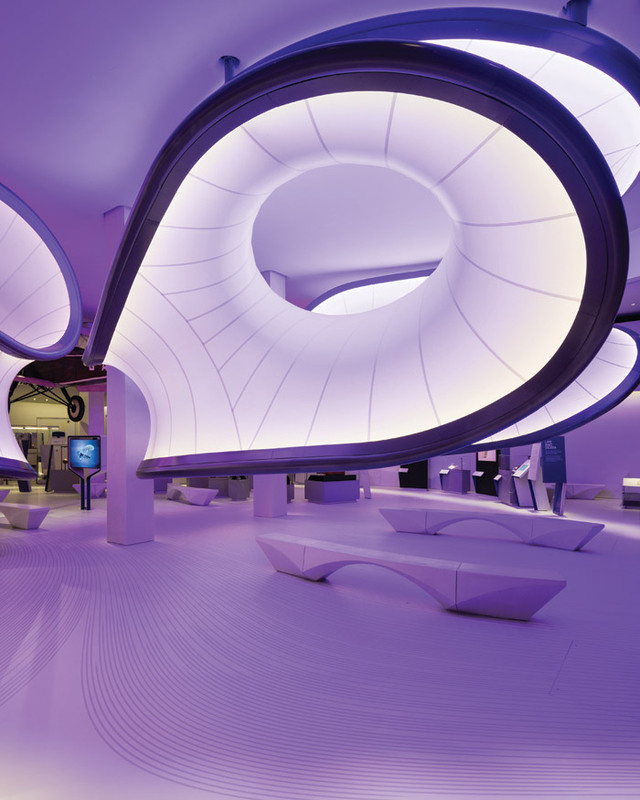 The fluid surface, lit up in a garish purple and pink, navigates visitors through the space, the airflow translated into route lines on the floor and informing the arching shape of the robotically manufactured benches. The cocooning, womb-like shape also helps zone off the space into six themes, from trade and travel, through war and peace, to life and death. Some 100 gadgets and historical artefacts, have been selected from the Science Museum collection, representing the work of not only statisticians and engineers, but also architects, garden designers, gamblers, cryptanalysts, coders and traders. Highlights include a machine made for the London School of Economics in 1952 by engineer-turned-economist Bill Phillips that visually models the British economy using the flow of water to represent money, and the pioneering Wizard pattern-recognition machine that was designed to mimic the way the brain works and, until 1995, was used for banknote recognition, voice analysis and covert surveillance for the Home Office. Breaking down the boundaries between art and science, there are constant references to architecture too, with a model of the Thames Barrier pier (1982), developed using elaborate mathematical modelling of the Thames Estuary and a Twenties’ calculator for reinforced concrete, among other items. More obscure objects range from a box of glass eyes used by statistician Francis Galton in 1884 to measure the physical characteristics of the British public, through an intelligence test devised in 1931 to test the mental abilities of children, hand-labelled and stored in its original, anonymous, old suitcase, to tissue samples collected across four decades from 1950 by pathologist Chris Wagner to help prove a link between asbestos exposure and lung cancer. Sadly Zaha Hadid didn’t see this project completed - by the time she died only the flooring was in place. But as someone who used to visit the Science Museum on trips to London in her teenage years for inspiration, she’s left a legacy for younger generations that shows the many tangible, inspiring ways mathematics informs our daily lives.